A newly installed garage door is a wonderful thing. Most homeowners take measures to ensure such an expensive investment keeps its new appeal and smooth operation for as long as possible. 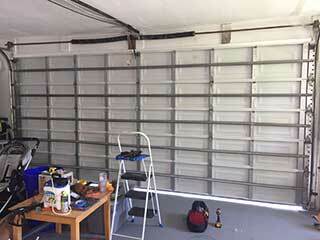 While a garage door is a complicated mechanism, keeping it in a good working condition is relatively simple. Your garage door consists of quite a lot of moving parts, many of which grind and grate against each other, causing friction. In time, this friction will wear away things like the springs, rollers and hinges. A regular application of the proper type of lubricant will ensure your garage door keeps opening with a smooth motion, while at the same time reduce the accumulation of wear and tear damage. When one of the different parts of your system starts to malfunction, it can start something similar to a chain reaction that can disrupt the delicate balance that all the moving parts are under. One thing starts to go wrong, then another, and another and then you have a serious problem on your hands. A regular visual inspection will help you identify any potential threats to your door's status quo. Keep in mind, though, that even the initial minor issues should probably be handled by experts, to avoid exacerbating the situation. When it comes to your garage door, knowledge is power. The more you know about your door and how it works, the more proactive you can be in ensuring it continues to operate efficiently and keeps your home and family safe and secure. Make sure you know how to use your garage door during power outages. This is done by pulling the opener's manual release cord. Your owner's manual will provide you with the instructions and guidelines on how and when to use this feature. Remember, though, that you must never pull this cord while the door is open, as it effectively disconnected the opener, and the door could slam shut as a result. If at any point you discover something wrong and need some professional help, remember that our experts at Garage Door Repair Encinitas are just a phone call away.